But we confuse the two. We get into situations where we think because we love someone that we NEED them in order to feel whole. If you are needing someone to be something or do something for you to feel whole, then realize that that is never love – it is in fact only need. Need is what we need to learn to give to ourselves. Once we take care of our own needs, then real love follows. But we have a habit of looking for love and then putting our needs on that love as if it is our love’s responsibility to fix us or save us from ourselves. It is no one else’s responsibility to give you what you NEED. It is your responsibility to take care of your own needs and make sure you always have what you need in order to feel whole in yourself. When you can manage your needs effectively, real love has the opportunity to complement you, not complete you. When you manage your needs, you find that the love you attract is always able to give you what you need, because you have given it to yourself first. For example, if you need someone to provide for you, learn to provide for yourself. If you need someone to see you as successful, find success in yourself. If you need someone to see you as beautiful, see the beauty in yourself. Once you have honored those needs in yourself, real love will be able to provide you with so much more richness and happiness. 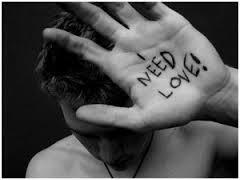 So remember, need is need – it is never love. Real love is the ability to give yourself what you need in order to feel whole. All you need is love – real love to be whole and it starts with yourself.